Last weekend I decided that I couldn't handle it anymore. 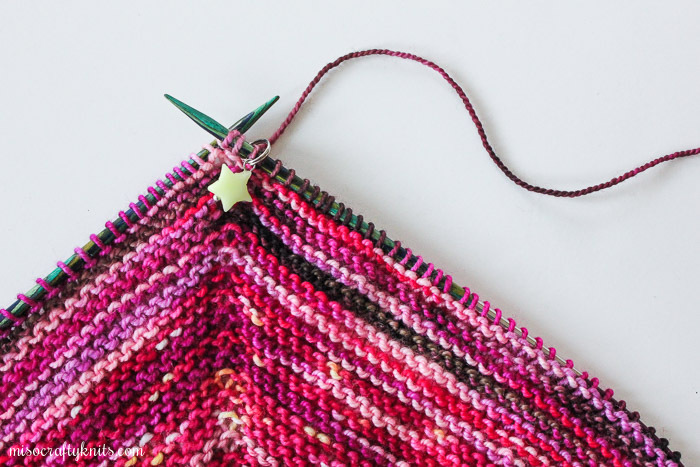 Even though I still had some time-sensitive projects on my needles, I NEEDED to cast on Ambah's Adventurous Wrap. And so I did. No, I don't have all my colours sorted out yet, I just know that one half of the wrap is going to go from pinks blending into purples and then grey into black. The other half, I have this vague idea of using yellows that blend into orange and then grey into black again. Or so that's the game plan, for now. It's funny how different colours look when in skein form versus when knitted up. I thought my original colour lineup was drastically different from one skein to the next when I had laid out the yarns side by side. But then I started knitting. I'm currently knitting with my sixth colour and already I've ripped back colour sections, changed up the order of my yarns (a few times), and switched out colours (twice!). I didn't dive into my minis and leftovers with the intention of doing a fade and yet it seemed I was aiming to achieve one. Once I let go of the notion of having a fade (and a perfect fade at that!) I think my colour picks now look a whole lot better in my mind! I'm finding that this project is quickly becoming "potato chip knitting". Changing yarns every handful of rows, seeing what the next colour looks like knitted up, and seeing my pile of minis get smaller and smaller certainly adds to the excitement of the project! Although, I'm definitely not looking forward to all the ends that I'm going to have to weave in. If I was smart, I would start weaving them in now...but where's the fun in that?? Anyhoo, even though I'm not that far into the project, I've already discovered a few things. Such as the fact that I'm not using up as much of the yarn as stated in the pattern, despite the fact that I am getting gauge. I have no problem with this, as a matter of fact, it has given me hope that I can use up more of my minis than I thought I would be able to! You see, the majority of my minis are from hexipuff swaps from years ago, so the yardage in these minis are a little on the small side since a hexipuff took only 15-30 yards (approximately 14-27 metres) to whip up. Each of these little minis was meant to knit one or two of those puffy hexagons. 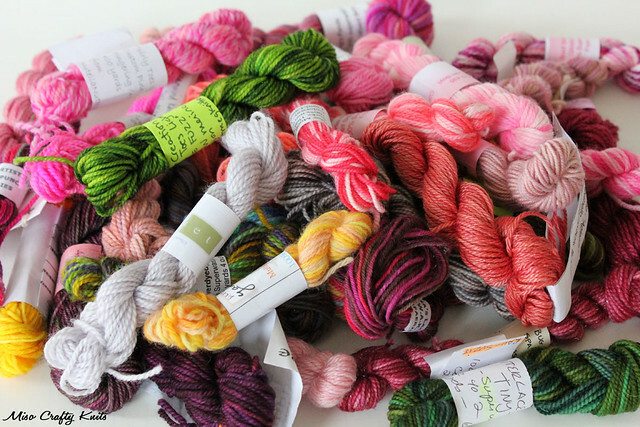 Nowadays, when we think of minis, we think of Madelinetosh's Unicorn Tails or Hedgehog Fibres' Sock Minis, both of which are 52 yards (47 metres) and 87 yards (80 metres). Quite a difference from the minis of yore! Since discovering that I'm not eating up as much yarn as I thought I would, I've revisited the yarns I had picked out for the other half of the wrap. I've swapped out a few colours for the ones that I had originally picked but thought I couldn't use due to the lack of yardage. Yay for being able to use up even more minis! !